The buffet was actually in great shape when I got it and didn't need much more prep work than a good cleaning. Here is the Before picture. 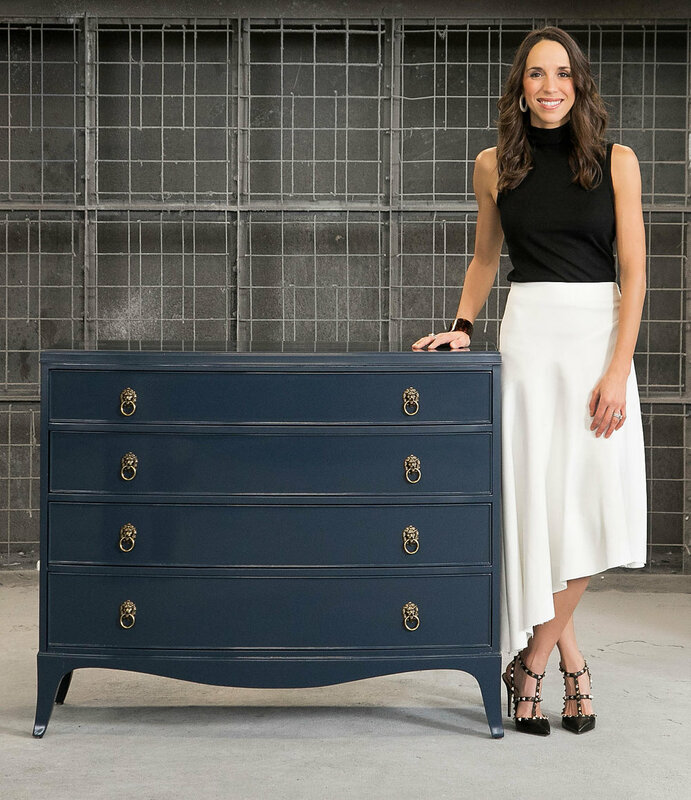 One factor that comes into play when deciding how to makeover a piece is the material used for the top. A lot of pieces from the '60's - '80's have a laminate top. This material is great for durability, however it eliminates the possibility of re-staining the top. Since this piece is solid wood, I wanted to highlight that feature by giving the top a fresh coat of stain with Jacobean Minwax . Once that was done, it was time to figure out the rest of the piece. The finish of the wood and the hardware really made the piece look dated. I wanted to freshen it up a bit and give it a light and happy look. For the base, I went with Annie Sloan's Duck Egg. It's a pale blue shade, and is a great contrast against the wood top. Here is how it turned out. The biggest update to the piece is the new hardware. I changed the location of the drawer pulls to simplify the look a bit. I then updated all the hardware with clear glass pulls and knobs. How great is this hardware?! I ordered it from D Lawless Hardware. They have an amazing selection of hardware (especially vintage looking styles like these) at very reasonable prices. If you're looking to update a piece of furniture or cabinets, definitely check them out! These knobs and pulls makes such a big difference and completely transform the piece. I also gave the edges a good distressing. For this, I used 220 grit sandpaper. I feel like the distressed edges help to tie in the dark wood top. Since the hinges were very specific to the piece and were still in great shape, I wanted to keep them. However the original brass color didn't coordinate with my new hardware. I gave them a quick coat of Rustoleum spray paint in silver. One added bonus to the piece...felt lined drawers! One of them is even customized with silverware compartments. I think the piece turned out great! One thing I'm not so crazy about though...the sterile office carpet and baseboards in the background! While I'm loving the new work space, one drawback is it's harder to find a place to stage my pieces. For now, an office showroom is the best I have. I guess it's time for me to get creative!